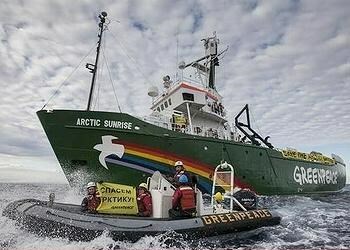 On September 18, 2013, Greenpeace International sailed into the Pechora Sea in the Arctic under the Dutch flag on the Arctic Sunshine to protest the Russian oil giant, Gazprom Neft’s Prirazlomnaya oil rig. Greenpeace aims to stop the world’s first oil from being produced in these ice-filled Arctic waters. In fact, they want to end Arctic oil drilling altogether. Soon after this stunt, the activists were detained by the Russian government and became the international sensation known as the Arctic 30. Russian authorities detained the activists for over two months after much international media buzz. This series of events begs the questions, why did Greenpeace target the Prirazlomnaya oilrig and why does Russia and its largest oil and gas company, Gazprom have such a stake in Arctic energy? The majority of Russian oil production so far has come from the brown fields in western Siberia; however, these fields are declining and Russia needs to explore new fields to compensate for the lower extraction rate. There are believed to be 20% of the world’s undiscovered oil and gas in the Arctic. Specifically, it is estimated that the Arctic holds about 90 billion barrels of oil and 47.2 trillion cubic meters of gas, equivalent to 13% and 30% of the world’s undiscovered oil and gas. According to the United States Geological Survey of 2008, due to climate change and the melting process of the Arctic ice caps, the plentiful reserves are becoming more accessible. The severity of the Arctic climate, including freezing temperatures, ice, wind and darkness, create a financially and technologically burdensome task. Greenpeace has successfully captured the world’s attention and brought new light to the issue of Russian Arctic oil and gas extraction. Why does Russia need the Arctic? Russia lays claim to about 60% of the Arctic’s oil and gas reserves, or 350 BOE (barrels of oil equivalent), according to Ernst and Young. BP’s Statistical Review of World Energy claims this is much more than the oil reserves of Saudi Arabia and the gas reserves of Qatar taken together. Russia has a number of reasons to explore the region. The majority of Russian oil production so far has come from the brown fields in western Siberia; however, these fields are declining and Russia needs to explore new fields to compensate for the lower extraction rate. There are currently three targeted possibilities: Eastern Siberia, unconventional oil and the Arctic Ocean. The Russian territory of the Arctic Ocean is said to contain 350 BOE, whereas the Eastern Siberian region holds 4.7 billion barrels (0.75×109 m3) of oil according to a 2007 EIA report. The offshore Arctic fields are important not only to Gazprom, but also to the Russian state. According to the Energy Strategy of Russia 2030, one of the state’s main goals is to achieve regional energy security through measures including “regional strategic initiatives of the state and energy business” namely underdeveloped regions such as Eastern Siberia, Far East Yamal Peninsula, and the Arctic. Notably, the Arctic is cited in the formal strategy as an important component of the Russian oil and gas future, solidifying its importance to the Russian state. Russia and its companies are looking to the Arctic Ocean to maintain their output of about 10 million barrels of oil a day. The New York Times stated that without Arctic drilling, Russia’s oil production is projected to decline by about 1 million barrels a day by 2020. Gazprom’s serious interest in the region stems from its desire to secure energy relations with the developing Asian market. China looks to Russia as one source of oil and gas for its growing economy. So far, Russia has been eager to sell its hydrocarbons to China, and now China is looking to invest in the expensive Russian offshore projects, thereby creating benefits for both countries. China also seeks to strengthen its ability to access Arctic resource bases, including hydrocarbons in Russia. Gazprom Neft Shelf ’s chief, Gennady Lubin, stated that the “possibility of accidents is extremely low” and if there is an accident, [Gazprom is] fully prepared. Foreign investment, as well as foreign demand, is a crucial element of Russian Arctic development. According to Russian law, only Gazprom and Rosneft are able to produce oil and gas in the offshore Arctic and they both rely on the technology and financing of International Oil Companies. Why did Greenpeace choose to protest the Prirazlomnaya oil rig? Greenpeace is a nonprofit organization that aims to preserve the global environment. In 1971, Quakers, pacifists, ecologists and journalists founded Greenpeace in an attempt to end nuclear testing in the Alaskan Arctic Ocean. Their mission statement succinctly reflects their purpose as “an independent campaigning organization, which uses non-violent, creative confrontation to expose global environmental problems, and to force the solutions which are essential to a green and peaceful future.” The organization believes activism is the best was to capture an audience. The Arctic Sunrise has been used for many diverse missions, including missions that did not directly target companies or governments. In 2009, the ship spent many months working around the coast of Greenland and Arctic sea ice, documenting the effects of climate change on the region. Greenpeace pays special attention to the Arctic; they organize Arctic concerns under the umbrella of climate change. Its members believe that the world is on the brink of runaway climate change. In order to achieve its stated mission, Greenpeace resorts to attention-seeking behavior that alerts the rest of the world of their bottom line: the environment must benefit. The independently funded Canadian organization argues that the Arctic region is one of the most fragile regions on our planet and is in desperate need of more protection. In this delicate region, it is the issue of global warming causing the polar ice cap to melt that needs to be addressed. Not only does this have negative effects for the Arctic peoples and wildlife, it also has negative effects for the rest of the planet. As the white ice cap is replaced with dark seas, sunlight is less and less reflected in space, resulting in more warming of the planet. Another environmental concern is the release of methane – a greenhouse gas – contained in the permafrost areas caused by the melting of arctic ice. Greenpeace argues that this accelerates the global warming process. The Arctic’s environment poses serious difficulties to exploring and drilling for oil. Ice, darkness and other challenges make drilling in this region much more difficult than land exploration. Renowned companies such as Shell have delayed their exploration due to unexpected difficulties. Gazprom expects no difficulties and is confident it can safely explore the region. 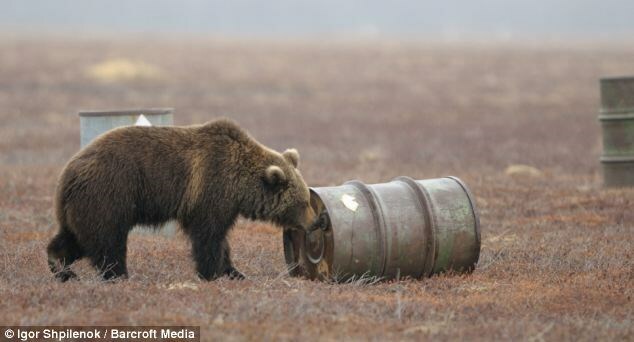 Greenpeace argues that Russia is not a role model of environmental safety and should not explore this fragile region. Amidst the media attention of the Greenpeace activism in the Pechora Sea that often focuses on the Arctic 30 and the subsequent geopolitical implications of their actions, Greenpeace’s exact opposition boils down to a few factors: symbolism, safety and environmental hazards, namely oil spills. 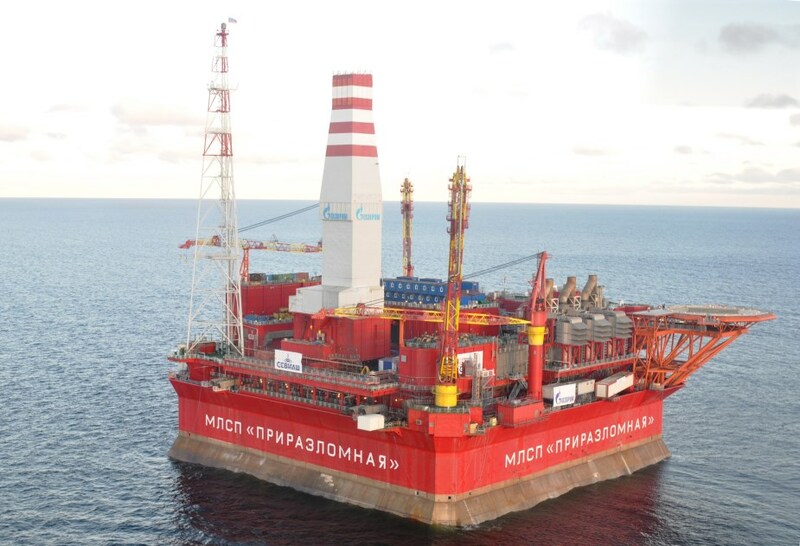 The NGO targeted this oilrig because it claims in its Gazprom media briefing in September 2013 that “the Prirazlomnaya platform is really only the start of Gazprom’s Arctic ambitions.” They see calling attention to the first Russian oil rig as a symbolic gesture to influence oil drilling in the Russian Arctic. According to Greenpeace, Russia is responsible for half of the world’s oil spills, which amounts to roughly 30 million barrels of annual inland petroleum leak. In the same interview, Lubin stated that the “possibility of accidents is extremely low” and if there is an accident, they are fully prepared. Greenpeace points out that Gazprom’s plan to develop the Prirazlomnoye oil field poses a crucial problem in that the local rescue services are incapable of cleaning up large oil spills; the nearest rescue infrastructure is located in Murmansk, a thousand kilometers away from the drilling site. The decision to start the oil drilling by the Prirazlomnaya platform is contrary to the Russian president’s commitment to ensure the environmental safety of projects focusing on the prospecting, producing and transporting of hydrocarbons on the continental shelf of the Russian Federation, Greenpeace’s September media briefing further claims. Finally, Greenpeace targeted the Prirazlomnaya oil rig in the Pechora Sea because of the dangerous ramifications of an oil spill, allegedly the number one concern of the NGO. Greenpeace’s Ben Ayliffe wrote in a September 2013 blog post on Greenpeace’s website that “the near-impossibility of cleaning up an Arctic oil spill is well-documented. The Pew Environment Group recently examined oil spill response plans for operations in the Arctic and warned that the oil industry is ‘not prepared for the Arctic, the spill plans are thoroughly inadequate’ adding that Arctic spill plans ‘underestimate the probability and consequences of catastrophic blow-outs.’ Analysis from the World Wildlife Fund found that industry proposals for assessing the risks of a spill in the Arctic were inaccurate, describing it as ‘imagineering, not engineering.’” Furthermore, Greenpeace states the “Arctic Sunrise is in the Arctic to expose and protect against the reckless oil rush unfolding there”. According to Greenpeace, Russia is responsible for half of the world’s oil spills, which amounts to roughly 30 million barrels of annual inland petroleum leak. There is doubt that any country in the world possesses sufficient technology and equipment to clean up large oil spills in the freezing seas. Greenpeace claims that both Gazprom and Rosneft are the worst Russian environmental polluters and claims that the Russian state and these companies together hid the truth about oil spills and other environmental damage to Russian land, rivers and oceans. The main reason for Gazprom and its wholly owned subsidiary, Gazprom Neft Shelf, to be present in the Arctic region stems from the state’s energy strategy. According to the subsidiary’s website, “Russia is currently carrying out a set of state programs aimed at strengthening the country’s energy security, enhancing its socio-economic potential, developing northern remote regions, and ensuring high-technology production.” It is specifically stated in the Fundamentals of Russian Policy in the Arctic Region for the period up to 2020 that the Arctic Ocean and its adjacent territories need to be developed to ensure national energy security up to 2020. Was Greenpeace successful in achieving its goals? Since Greenpeace’s mission statement is to expose global environmental issues to the public, then in the case of the Arctic 30, it achieved a great victory. However, if the goal of stopping Arctic drilling altogether is most important, then they might have only delayed production by a few days. Following the activism of the Arctic 30, a lot of media attention was directed at the Russian legal system and mistreatment of the activists, which at first glance does not benefit the environment. However, since Greenpeace is receiving such intense international support, this can only benefit the organization and thus its environmental causes. Further, Greenpeace has long accused Russia of being dishonest environmental abusers, and the case of the Arctic 30 provides tinder for that fire. Even though Greenpeace has not succeeded and perhaps never will succeed in stopping all Arctic oil drilling, it garnered a victory for its organization and with the support of the public, will forge ahead with mixed environmental and geopolitical goals. Koen van Delft and Katherine Bennett are MA students in the ENEPRO program at European University at St. Petersburg. ← Five Years on from the 2009 Gas Dispute: Are Russia and Ukraine any Closer to a Stable Arrangement?